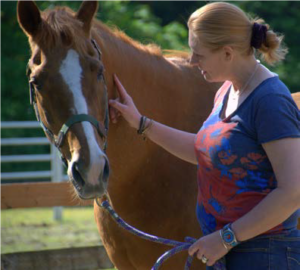 Human Equine Alliances for Learning provides post-graduate level training for professionals seeking to incorporate Equine-Facilitated Psychotherapy & Learning (EFPL) into their therapeutic or teaching practice or program. 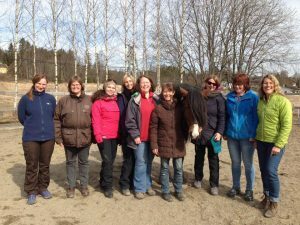 * This 5-month course prepares participants to facilitate horse activities for experiential psychotherapy or learning, helping clients increase relational ability, emotional well-being, self-awareness and empowerment. The teaching faculty includes Leigh Shambo, MSW, LPCC, founder of HEAL; with HEAL graduates Kristin Fernald, MA, LMHC, psychotherapist; and Sandy Matts, MA, TRI, founder of Raven Rock Ranch in Redmond, WA, USA. The HEAL Model™ for EFPL is a powerful and safe method for employing EFPL with a variety of age groups, client/practice types, and formats (such as individual/ group, short-/ long-term). The HEAL Model™ offers practitioners a scientifically grounded, ‘research-ready’ approach using HEAL’s “6 Keys to Relationship”. The focus of HEAL-EFPL is on the limbic/emotional communications between horse and human, which reveal the activation of primary social-emotional-behavioral circuits in the mammalian brain. Targeted exercises help the client experience and practice new pathways to healthier relationships. The HEAL model is trauma-sensitive, respectful and safe for client and horse, and provides a high level of social partnership experiences which translate reliably to the client’s human world. The HEAL Model works as effectively in both non-riding or riding therapy and learning programs. The HEAL-FTP is a 5-month program. 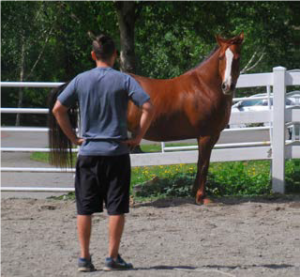 It begins with one full week of on-site instruction at a HEAL approved equestrian site in the Pacific Northwest Puget Sound region, USA. After this, students spend 10-12 hours per week in distance learning from home, including EFPL practice sessions, reading assignments and peer conferences. The final week is again at the approved HEAL site when students complete supervised sessions with HEAL clients. HEAL supports graduates with continuing education, mentorship and supervision. Applicants should have Master’s level or equivalent education and experience in human growth and development such as psychology or psychotherapy, social work, clinical mental health counseling, teaching or coaching; and 2 years experience in the field of human services. In addition, a minimum of 3 years recent and regular horse experience is highly recommended; candidates should feel confident in basic horse handling with a relational focus to create a “willing and safe partnership”. In HEAL FTP, students learn to understand horses as sophisticated emotional and relational beings; this may be very different from more traditional approaches to recreational, sport, or competitive riding. Prepare to be amazed when horses are allowed to freely demonstrate their “emotional genius”! Some HEAL FTP applicants may use, or plan to use, a team approach to EFPL practice – i.e. the clinician or educator supported by a horse specialist as their practice partner. Practice partners are encouraged to attend HEAL FTP together when possible, which amplifies the learning and effectiveness for the team. Accepted teams are eligible for a 15% registration discount. Prerequisite: Attendance in a HEAL Keys to Connection workshop or 6-hour private intensive with a HEAL Trainer, and a completed program application. Graduates will be able to understand and address the following components of human emotional functioning as they unfold in Equine-Facilitated Psychotherapy and Learning (EFPL), and be prepared to manage these dynamics in practice. Facilitating a client through experiential exercises and maintaining a safe container. Be able to teach and practice the basic HEAL Model™ as it applies to people and horses. Learn how to differentiate the applications and styles which will best apply to each unique circumstance. Understand the concepts of boundaries, projection and transference and their role in the EFPL experience. Understand your personal history, experiences, body cues and thought patterns and be able to deal effectively with your counter-transference issues. Learn to use your own body as a “sensing device”, determining your physiological, emotional, and mental state prior to any engagement with the horses or a client. Teach the client how to determine their physiological state in the present moment and help them to clarify emotions and make healthy choices using emotions as information. Assist clients in identifying their own “coping strategies” and behavioral patterns which have helped them to survive. Help develop new behaviors and thoughts which help clients to thrive and not just survive. Learn to personally identify the subtle energetic clues from the horse, and assist clients in identifying their own subtle messages, thought patterns, and the effect these have on interactions with people and horses. Be able to clearly and quickly identify when a client needs immediate assistance and intervention, psychological or equine support, and know and accept your personal limitations. Utilize and incorporate the HEAL Relationship Keys™ in all interactions with humans and equines. Participants should enter the program with working knowledge of standard equestrian safety practices with horses in a teaching atmosphere where beginners will be present. Identify guidelines for physical and emotional safety for horses and clients, and understand how to structure and present equestrian safety to best serve different types of clients. Practice and understand the underlying principles that guide the horse-human relationships toward positive and co-creative outcomes. Translate and generalize horsemanship principles to human relationships and emotional states. Recognize a variety of emotional and energetic states that impact horse-human communication; and support, facilitate, or assist the client to manage such states during horse activities. Develop targeted EFL approaches/activities to serve the developmental and emotional needs of specific clients or groups. Understand the demands and impact of EFL for the horses you have, develop your herd for your unique practice, and care for your herd’s emotional well-being. Balance and integrate instructional, guided, and facilitative approaches in horse work with specific techniques that serve immediate and long-term client needs. Facilitate a variety of activities on the ground, on lead, at liberty, or under saddle in ways that strengthen and develop positive emotional functioning. Read and interpret the horse’s subtle communication and work effectively with the client’s interpretations and attributions.